When you think of San Francisco architecture, chances are you picture colorful Victorians with bay windows and ornate molding. But if these cutesy doll houses are symbols of the past, a new kind of building design, one that values innovation over preservation, represents the future. Nostalgic San Franciscans fight the trend, shaking their fists at the glass and aluminum growing out of Yerba Buena Gardens and the live/work developments that house Silicon Valley neophytes. The debate goes beyond zoning and construction, and into the realms of art and politics. Who gets to design the new San Francisco? 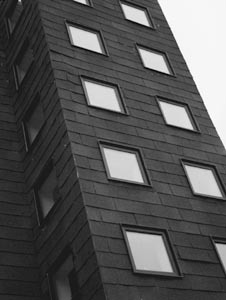 What makes a building valuable or beautiful? To answer the questions, Metropolitan caught up with ground-breaking architects who apply revolutionary new techniques to alter not only the city landscape but also the field of architecture itself. Over the past 10 years, their modern ingenuity has impressed even the most staunch traditionalists. A combined sewer system that works with human effluent and storm water, the Oceanside Water Pollution Control Project was designed to reduce the discharge of pollutants into the ocean and bay. The new project operates without the noise, spillover, odor and raw-sewage wash-up of the poorly equipped previous plant. While engineers tackled the utilitarian nature of the system, architects and site planners made sure the project did not interfere with the neighboring zoo's eventual expansion. Inconspicuously set in a man-made canyon, the project is a maze of subterranean tunnel-linked chambers. Above ground, polished stack cylinders sit alongside four "bulbous, onion-shaped domes of the digesters" as steel catwalks and spiraling staircases run from onion to onion. While gutting and reconfiguring warehouse space is not uncommon in SOMA, the transformation of the historical Oriental Warehouse into 66 live/work loft spaces is far from ordinary. "What we have, in essence, is a 21st-century warehouse slipped in a 19th-century warehouse," explains Rodney Friedman of Fisher-Friedman Architects. In order to bring the building up to code, Fisher-Friedman had to preserve its original brick skin, resulting in a new building that is inset 15 feet from the original structure's walls, with internal pedestrian streets running between the two. The architects also had to rebuild a structure wounded by earthquakes and fires. The outer two of the building's three 65-foot-by-200-foot bays were unsalvageable and converted using industrial-style corrugated metal and aluminum. The middle bay was intact and its original heavy-wood construction, including timber-roof trusses, was reclaimed rather than replaced. 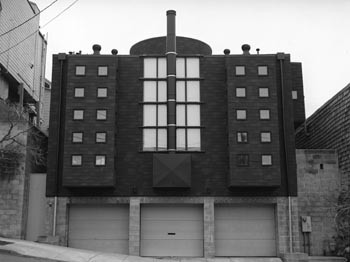 Aaron Betsky, architecture critic and curator of architecture and design at the SFMOMA, remarks, "The renovation maintains the spirit of the loft as the ultimate Modernist space: a functional re-adaptation of an industrial structure that is as malleable and temporary as the lives it houses." 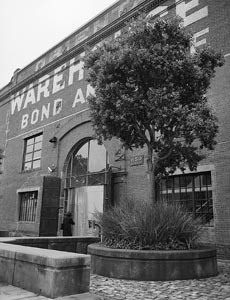 Sentimental Warehouse's metamorphosis within a historical context is a fitting symbol for the South of Market area. This quirky house was commissioned by composer Patrick Gleeson and his wife, cellist Joan Jeanrenaud. The split-level plan responds to the steep hillside and is organized around two interlocking spiraling staircases. John Ellis of Solomon Architects calls the design "deliberately ambiguous." A misleading five rows of miniaturized windows run up three stories, framing the bay. From the front the house is strikingly somber as black asphalt shingles conjure dark images, but the geometry and generous windows usher in light. And even on a gray day, light streams into the house through a plexiglass-domed oculus above the staircase. From the back of the residence narrow steps lead to two sound studios, rhomboid-shaped for acoustics. The studios extend laterally to either side of the house and forward to the two interlocking spiral staircases. One staircase goes down to the garage, the other leads up to the large 20-foot-tall living room. The single-level, double-height space has lofted bed and bathrooms. Kitchen and sitting areas are located underneath the loft rooms combining an open plan with differentiated height. 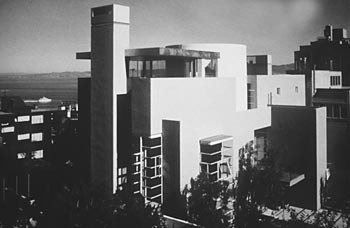 The extraordinary house appears in The Joy Luck Club, in which Lena's mother laments that while the home cost a million dollars, the walls are still crooked. Head designer Ed Tanaka and assistant project manager Joe Monteadora (Del Campo & Maru) conceived of the New Sheriff's Facility as "an innovative answer to the otherwise mundane problem of providing jurisdiction with bed space." 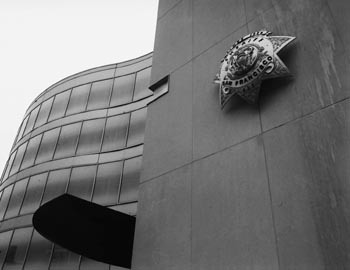 The architects worked closely with the sheriff's department to improve on the prior facility's layout, while complying with mandates on cell size and security. The result is an architecturally profound facility that is also sensitive to employees, inmates, and city and state requirements. Dubbed the "glamour slammer" for its glinting aluminum and glass facade, the facility is unabashedly attractive considering its purpose. Douglas Hollis wrapped the structure in an undulating translucent glass wall which shields the community from the building's "guests." At the same time, every cell has a window with a view of the downtown skyline. While some might consider this an amenity, Monteadora believes it's sad to imagine someone on the inside watching the whole world pass without being able to participate. The design for the building itself was lifted directly from the original bubble diagram. Monteadora draws three circles on a piece of paper with lines between them to indicate corridors: "You want to have the inmates in one area and you want to have an area of program space and you want those linked. You also want to have a med/psych component with an infirmary." Previously these sections (minus the medical facilities) shared one large building. Now one "circle" serves as the med/psych ward, another as housing intake, and the third for incarceration, with secure corridors connecting the three. The jail has a centrally located podium midway between floors where stationed guards can see into every cell on two floors for 270 degrees. The benefits of a pan-opticon jail, where inmates have the sense of being constantly watched, are obvious. While the New Sheriff's Facility's integration of art and utility is the result of good chemistry from a talented team, it remains to be seen whether it will be a model for future public buildings. In an urban environment where good views, spacious backyards and a parking spot are as common as found money, architect Jim Jennings managed to outwit the obstacles. Originally commissioned by art collectors Steven and Nancy Oliver, and now home to venture capitalist Bill Brady, the Oliver-Brady house has it all: privacy, a courtyard, a panoramic view of the city and an underground parking garage. The house sits on the garage, its guest bedrooms located on the first floor; kitchen, living and dining rooms on the second; master bedroom and sitting room on the third. 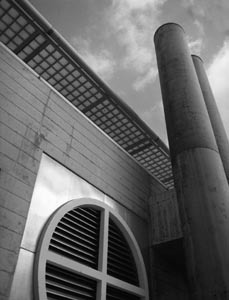 Shooting up from the center of the building is a massive concrete vault that encircles bridges, stairs and an elevator. The elevator shaft is clad in anodized aluminum panels, and the bridges have sandblasted glass-plank walkways. The combination allows a progression of light to reflect off the shaft and into the house. The cylinder's central skylight doubles as an observation deck with a steel-braced glass floor. Architectural Digest calls Jennings a romantic modernist: "He retains an essential belief in the power of architecture, producing rigorously modulated spaces that are rich in exacting detail, subtle texture and carefully controlled light." 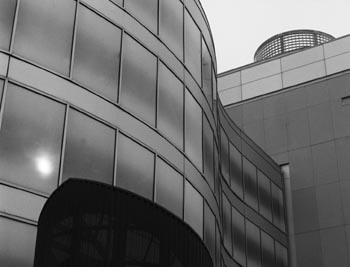 In addition to providing light and access to various parts of the building, the spatially rich rotunda is seismically sound and serves as an anchor. "To me," Jennings explains, "the cylinder, which the whole building literally hangs on to for support, exemplifies the tactile and visceral essence of architecture." This house exhibits curious lifelike qualities. Its curved walls roll down Felton Street for a view of the city skyline, while the similarly animated rear overlooks McLauren Park and the distant South Bay. Though its shape is extraordinary, the house is as notable for the evolutionary quality of its architecture. The cement plaster "rock" used to affix the plywood is blue-gray, while the stones in the cement plaster mix are maroon. "Over time, as the plaster wears from the surface of the stones, the color will shift from cool to warm," says Jeremy Kotas of Kotas Architects. The exterior walls were sheathed in planks of cedar-face plywood, then stained and joined together by neat metal horizontal z-strip flashing. Forming a sort of plywood basket, the walls were then lodged in cement plaster. Jeremy explains, "Faith's House was designed to employ curved walls to shape and focus the interior spaces toward the larger world outside." The house is as much a view as the one it strains to behold. Don't be misled by this building's name. The Glen is "Green" because of its previous owner, E.A. Green, and not the massive, translucent green wall that protrudes alongside its entrance. A combination of rich history and state-of-the-art design, this office complex was once the Dairy, and later a linen service. 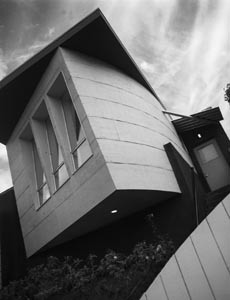 To preserve the pre-existing structure and keep out street noise, the additions made were subtle yet modern. The original structure comprised five unrelated buildings on a concrete loading ground, while the new compound is an assembly of interacting buildings that share a courtyard. Buildings connect internally through a custom-steel pedestrian ramp and open, glazed core stair and catwalk. The street side of the building is mostly kept intact except for the addition of aluminum windows. Focusing inward, the buildings share "an almost secret place." A secluded landscaped garden and fountain is the center of the structure. "Our design for the complex was intended to be highly experiential for its users." The entrance, a double-height angled glass and aluminum atrium, tilts back, while the green polycarbonate wall leans forward. Polycarbonate, a type of plastic, allows light to filter in without detracting from the glass entrance. 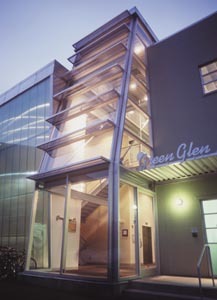 The voluminous, modern entrance stands boldly beside the simple original concrete block shell, showing off Green Glen's beautiful synergy of old-meets-new. From the February 21, 2000 issue of the Metropolitan.